Tucson was the happy puppy waiting for us at the Flying High Kennels. 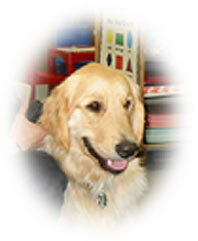 The Golden Retriever Breeder, Linda Frances, felt Tucson would grow to be just the kind of Service Dog I needed. She could not have picked a better companion for me. After spending hours of her time watching and socializing the puppies, and interviewing potential owners to make the right match, she gave to us the most wonderful dog that ever was. I owe many thanks to Linda for choosing Tucson for me. Also to Don, my husband, for he has always been a great encourager, and supported the idea of a Service Dog. So began our remarkable journey into miracles both large and small. If we can call miracles of the heart small. 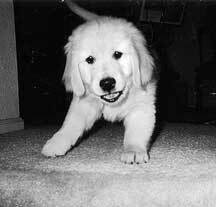 My first step was to find a trainer that could teach Tucson and me good companion manners until he was old enough to learn to serve me as a stabilizer when I walked. Walking had become increasingly more ataxic after 30 years of a MS related disease. The trainer we now needed was Brad Franz. He was recommended highly, and we learned so much from him. We will always call him "The Dog Whisperer" as his abilities to understand dogs and their owners was incredible. Tucson still wags his tail and runs around looking for him if we so much as mention his name. Spelling B-r-a-d does not work. Special Needs People do not always train their own dogs. So finding the right steps was not always clear. However, the end result was a true helper who stayed by my side and stabilized me whenever I put on his harness. Sometimes, even in harness, he still had a tough time not loving everyone around him. I realize a dog with two jobs could get mixed up, but reminded him quickly that he was working, and he snapped back his attention. The second job he has, came about when we observed that he was extra mild and gentle, and that he loved children even though we were not around any on a daily basis. So began our thinking that we should share Tucson's lovely spirit with others. After talking with the breeder and trainer, we started researching into the Delta Pet Partners program. 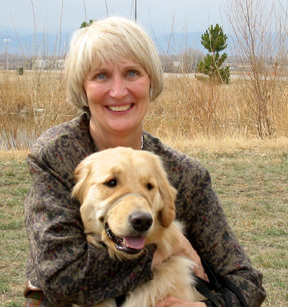 Diana McQuarrie and other trainers at the Denver Pet Partners observed the same qualities in Tucson at his young age of 8 mos. as we had. 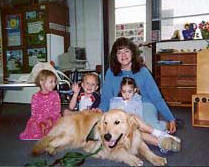 Thus we soon began the training with him and other Denver Pet Partners. I knew that my disability did not interfere with my work with children, and I wanted Tucson to be with his favorite little people. Being a retired Special Ed. teacher, I explored our options with Diana. We now work as a team with eight special needs kids at Sabin, and with a preschool class at Miller Special School. Tucson uses many of the walking skills he learned with me as he walks along with wheelchairs or unstable walking children. Also Tucson does a fine job at Our Saviour's Church. Sometimes he goes with me if I have a lot of things to do. He also has served as a greeter in the Narthex on Easter, as the Easter Puppy carrying a basket of goodies, and as the Christmas Reindeer. Last Easter the pastor asked the children during children's sermon, what happens at Easter. One little girl proudly announced, "The Easter Puppy comes." Well Tucson does come to help me, and to bring smiles to children of all ages. And he will be back again next Easter too I am sure as he was happy being with the children and taking them on a Easter Parade. Just about the time Tucson and I were on a roll, along came yet another miracle. It seems while Brad was training another dog he told the owner, Mrs. Bar-Or, that he had been diagnosed with CVID an MS type disorder. Mrs. Bar-Or knew of her husband's research at Swedish Trauma Center relating to MS, and told Brad about it. Brad remembered Tucson and me, and called encouraging me to check into this new discovery with Dr. Bar-Or. Several of us with Brad are now in Dr. Bar-Or's study with good results. Most of the time I am feeling so well that I did forget Tucson's harness time. My balance has improved to the point that I don't need Tucson for short walks or quick errands. I was so excited about my own new abilities that I had forgotten Tucson's main job. Soon we were noticing that Tucson acted sick and unhappy. After a clean bill of health from Bouton Veterinary Clinic, we called Brad. From one phone call, he diagnosed Tucson as being depressed because he had lost his favorite job. Well, we soon fixed that. I incorporated Tucson into my daily exercise regime, and we added extra walks with his harness even if I did not always need it. He has another morning of visiting preschool children, and I have another morning of bending and moving on the floor with preschoolers like I did years ago. 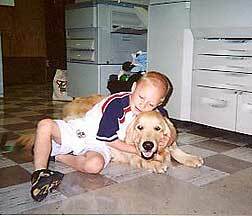 With all these contributions to the betterments of children's lives and mine, anyone can understand why I call Tucson the best dog that ever was... and still is! I think this story should be called, “Lin and Tucson the Terrific”! This is truly an extraordinary partnership. 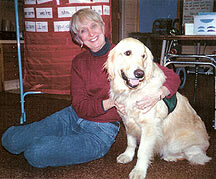 I remember vividly when Lin took the Pet Partners training class that I taught back in November 2002. It touched me deeply that someone faced with the challenges of MS was looking beyond herself and had such a heartfelt desire to help others with her service dog. At that time, Tucson was only 8 months old and just out of curiosity we took him through the Delta evaluation, even though the minimum age for therapy dog registration is 1 year old. Tucson displayed incredible discipline, good manners and focus even at that age as well as clearly having already taken on responsibility for Lin. Even though he was still growing into his then lanky legs, Tucson did a wonderful job of steadying Lin as he escorted her. To see them together is to observe soul-mates in action. Lin is one of the most beautiful people I know. She is gentle, soft-spoken, loving, thoughtful and has a heart that just keeps on giving. I don’t think I’ve ever seen Lin without a smile on her face. You can’t help but feel great when you’re around her. Tucson is extraordinary because of his ability to have such a keen awareness of his responsibilities as a working dog and to discern between his role as a service dog for Lin and a therapy dog for many people. As a service dog working in harness, his focus is solely on Lin and her safety. 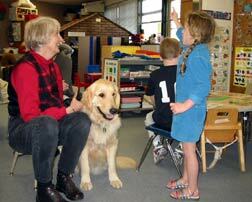 As a therapy dog working in his vest, his focus becomes outward and he gives of himself to those around him. I think he primarily identifies which role is expected of him from wearing either a harness or a vest. I also know that he’s just plain smart and has such an overflowing heart of gold that he easily and willingly serves both roles.